Kristy Hom: Through the pinhole... more low-tech, low-fi video in HD! Through the pinhole... more low-tech, low-fi video in HD! I put the pinhole body cap on my DSLR camera body (sans lens) to make these images and video at our local riparian area. I love the flares (and their rainbows) that come off the edge of the pinhole! Can you see a similar "rainbow" pattern here (only in black and white) like in the video? 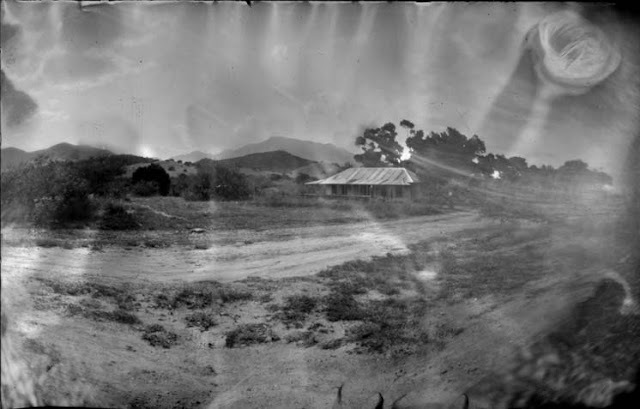 It is very pronounced anytime the pinhole is close to the direction of the sun- in either the "real time" digital pinhole, or in my paper negative images from my homemade cameras. Perhaps more play with the digital pinhole will help me reduce the flaring in my paper negative images, if I choose to minimize them, that is. SOmetimes, I sort of like those creative blobs and clouds! Here's the video I was commenting on. I was just thinking, on that bottom photo, that I really like those swirls and ghostly trails behind the building.